Last Friday evening my friend called me to ask a “big favor.” Her car had broken down and she needed someone to come and pick her up…in San Jose. Because I am such a good friend, and because I had absolutely nothing better to do on a Friday night, the wife and I took a little trip to San Jose, a pretty straight shot on the highway from Emeryville, where the exits were peppered with signs for In-N-Out Burger restaurants. Our friend and her partner had raved many a time about the deliciousness of this place, so on the way back we stopped to get them some dinner. Despite having already had a huge meal, I found room to sample a burger. Some people have a “dessert stomach;” I, apparently, have a cheeseburger stomach. 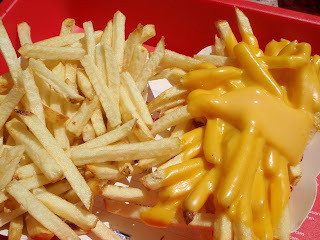 And so began a new-found obsession with In-N-Out. We went back the next day, had another cheeseburger, some fries with cheese, and split a chocolate milkshake. I think I would eat there every day if I thought it wouldn’t kill me. 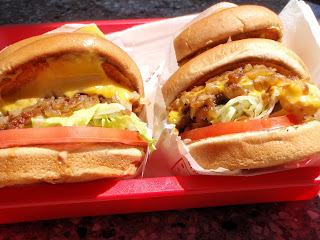 Why is In-N-Out so truly magical? 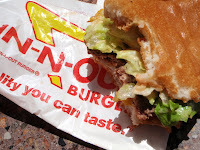 In-N-Out Burger, located only in California, Nevada, Utah, and Arizona, has had it’s virtues extolled by many a burger lover, but I am suspicious of everyone’s tastebuds, so I wasn’t expecting anything life-changing. The menu is simple: burgers, fries, shakes, and soft drinks. Their meat is never frozen and handled by their own butchers before being sent out to stores. The lettuce is “hand-leafed” and burger buns are baked in-house using slow-rising dough. The buns are awesome. Kind of crispy and grilled on the outside, and soft and chewy in the middle. Sigh. And then of course they have a “special” sauce. And a secret menu. That’s right, you can order a grilled cheese even though it's not up there. Same with the cheese fries. If they have all the stuff to make it, you can probably ask for it. (I’m sure there are some limitations here.) I also recommend getting grilled onions on your burger (or grilled cheese.) So there you have it kids—all the hype, it’s for real.